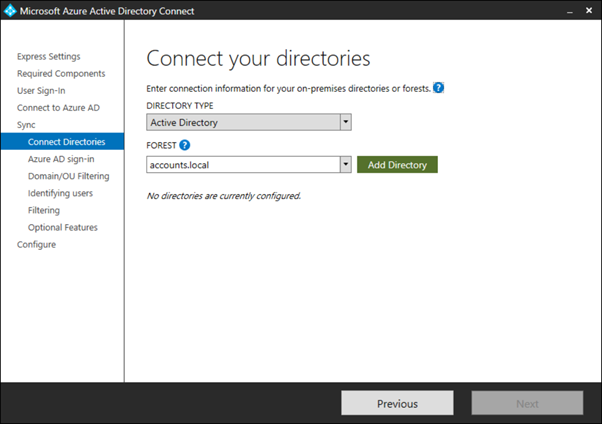 In this blogpost we will add an Azure AD Connect server to enable synchronization between the on-premises Active Directories and Office 365. 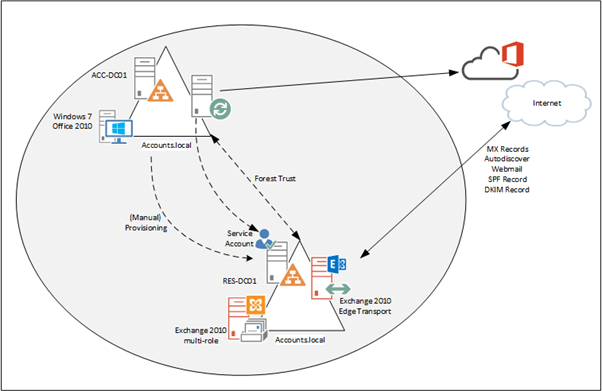 If we want to create a hybrid scenario with our resource forest and Exchange Online we have to implement Azure AD Connect first. 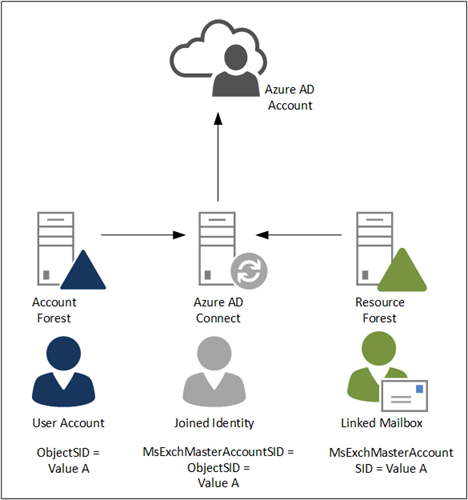 Azure AD Connect will synchronize account information from the account forest, and linked mailbox information from the resource forest. To achieve this, we have to setup a multi-forest synchronization model (which is also fully supported by Microsoft). 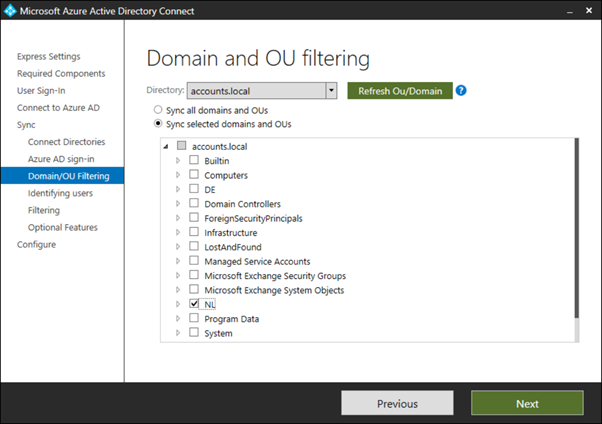 In a typical environment there’s only one Active Directory containing both user accounts and exchange servers. As such, the user accounts have the corresponding Exchange properties. 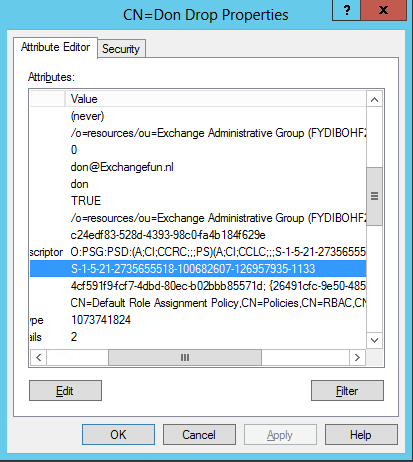 In a Resource Forest scenario there are two user accounts, where the user account in the Resource Forest is disabled and this disabled account contains the Exchange properties. 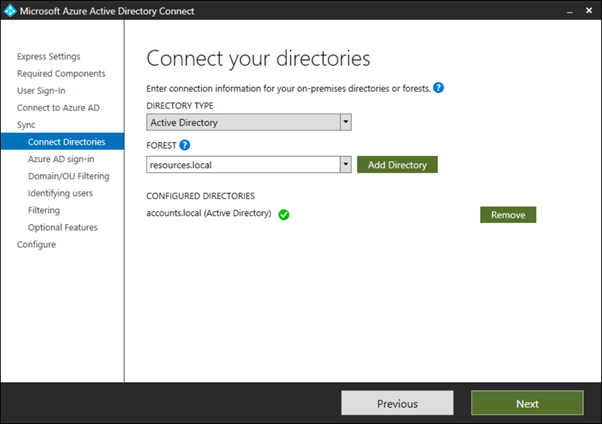 The prerequisites for Azure AD Connect is a Resource Forest scenario are the same as for a regular environment, so I won’t go into too much detail about this. Of course you need an internet routable domain for your accounts (i.e. 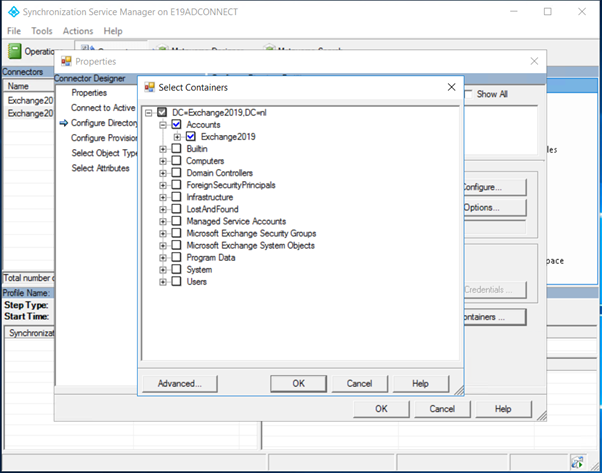 don@accounts.local won’t work, so this needs to be changed to don@exchangefun.nl), your accounts need to be checked for inconsistencies with the IDFix tool and of course you have to configure your tenant in Office 365. For more information regarding the process, please check my blog Implementing Directory Synchronization. It’s a somewhat older blog, but the steps remain the same. 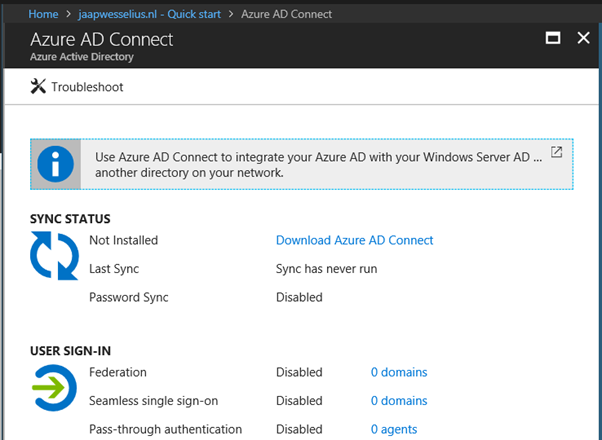 You can download the latest version of Azure AD Connect from the Download Azure AD Connect. 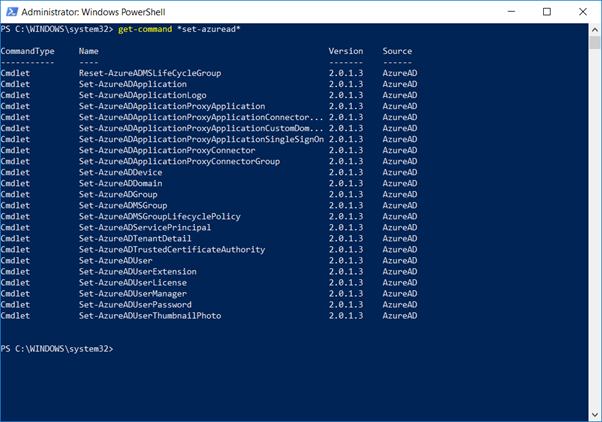 I will only show the most important screenshots when running the Azure AD Connect wizard. Continue with the wizard until you reach the User Sign-in window. 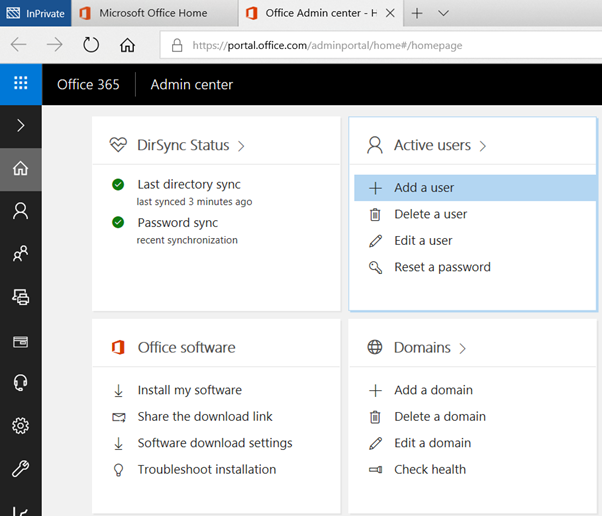 Here you have to select which authentication method is used when users sign-in into Office 365. Make your selection and click Next to continue. 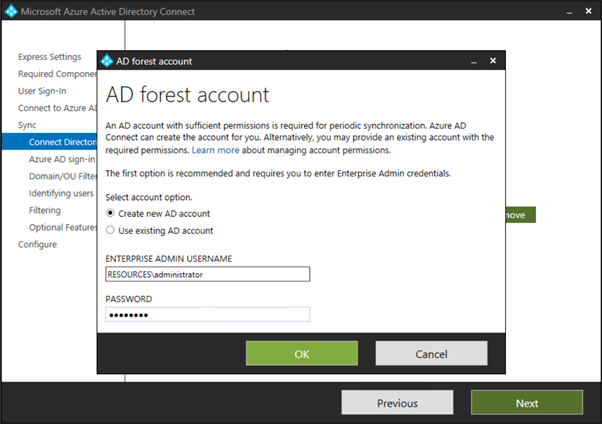 The Add Forest Account window will appear. 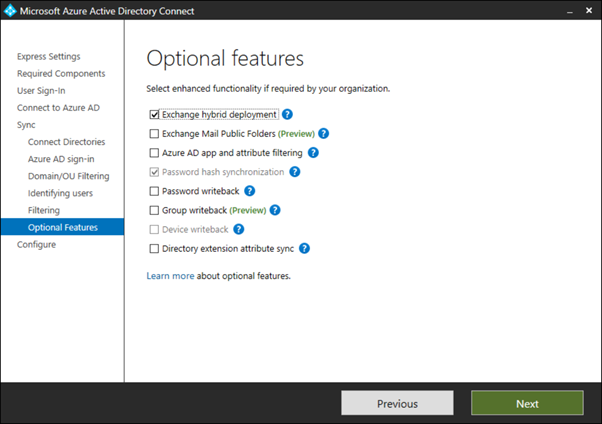 Here you can select if a new service account for Azure AD Connect will be created, or that an existing service account will be used. 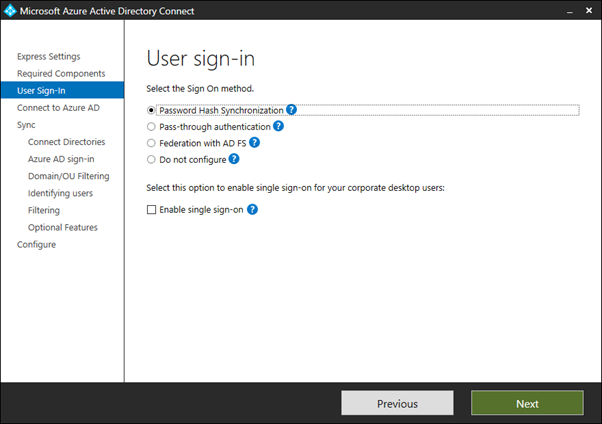 An Enterprise Admin Account will be used to create this service account, and configure Azure AD Connect for first use. It must be an Enterprise Admin account because information is written into the Configuration partition of Active Directory. 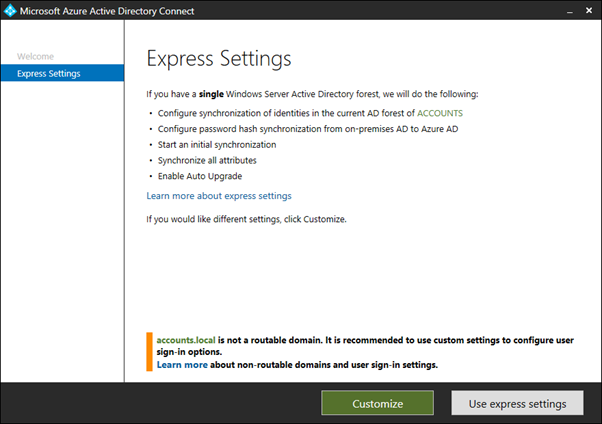 Enter the credentials of the Enterprise Admin (in your Account Forest) and click OK to continue. 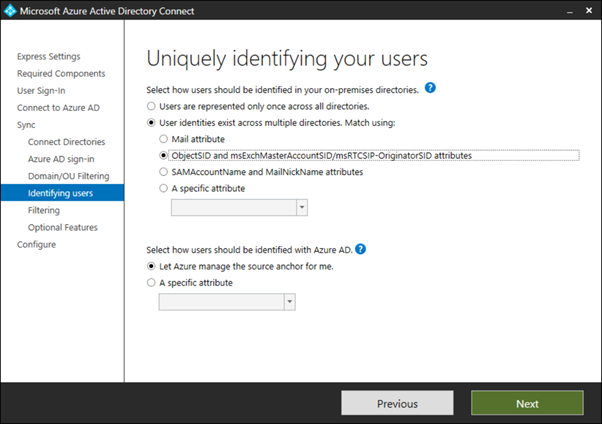 The Uniquely identifying your users is the most important window in the Azure AD Connect wizard. This is where the user account in the Account Forest and the corresponding mailbox in the Resource Forest are tied together. In the previous blogpost I’ve explained the objectSID and the msExchMasterAccountSID, so this option is selected. 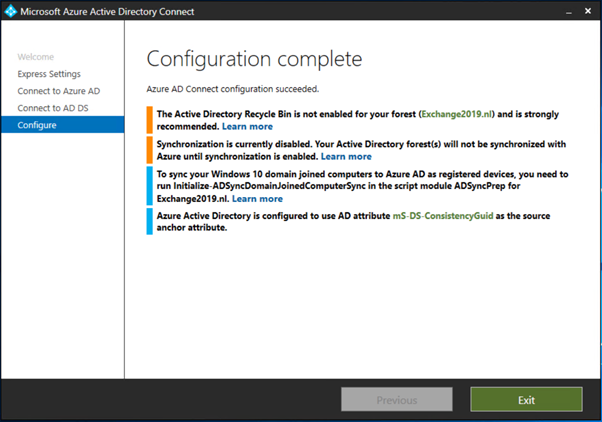 Continue the Azure AD Connect wizard, and in the Optional Features select the Exchange Hybrid Deployment checkbox and click Next to continue. 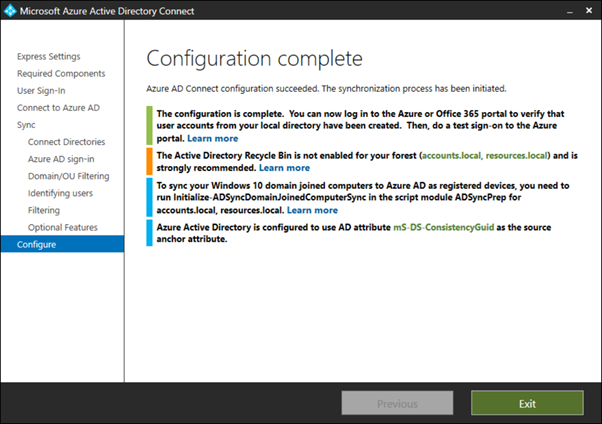 You’re now ready with the Azure AD Connect wizard. 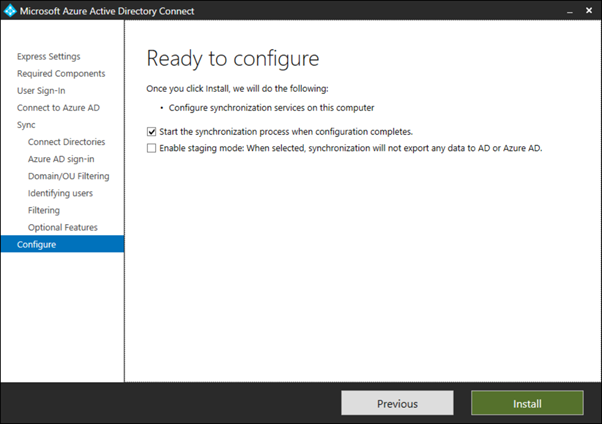 In the Ready to configure window you can chose to start the synchronization immediately, or enable the Azure AD Connect server in staging mode. 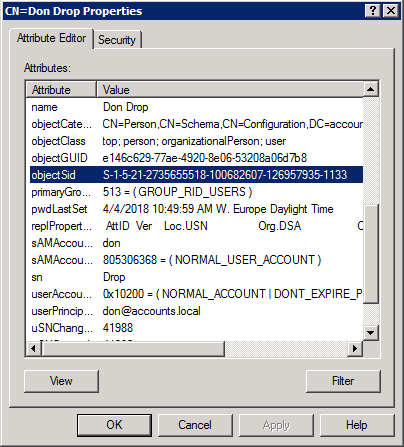 In this mode it will collect all information and fill the SQL Express database with data, but it won’t write any data to Azure Active Directory until you’ve checked everything. 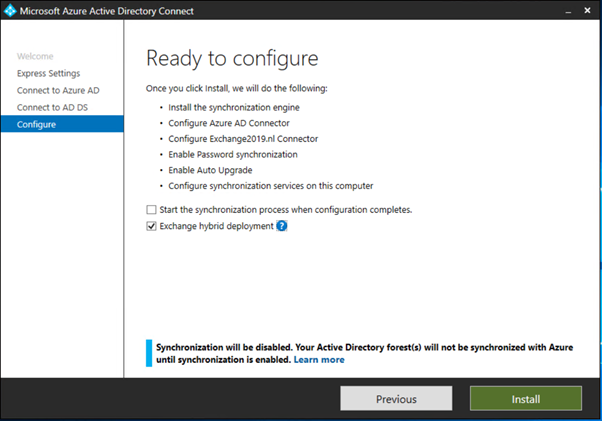 Select the option you want and click install to finish the wizard and install/configure Azure AD Connect. 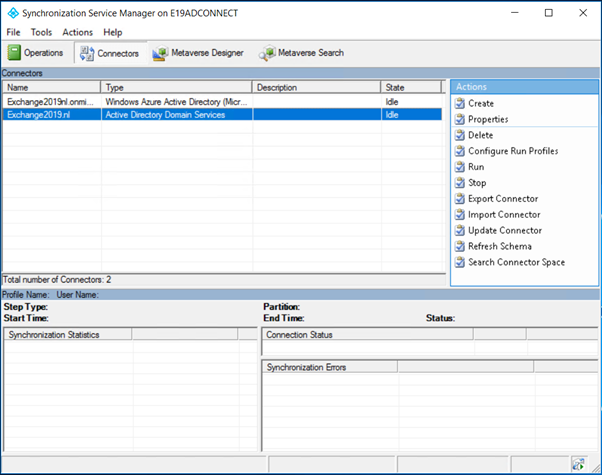 At the configuration complete window there are some recommendations and/or remarks for your reference, click Exit to stop the Azure AD Connect wizard. And when you expand the users option you’ll see which users are synchronized. 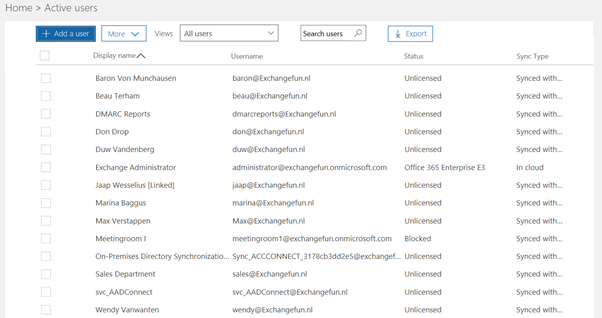 When you logon to the Exchange Admin Console in Exchange Online and check the Recipients | Contacts folder, you’ll see the users appear here. 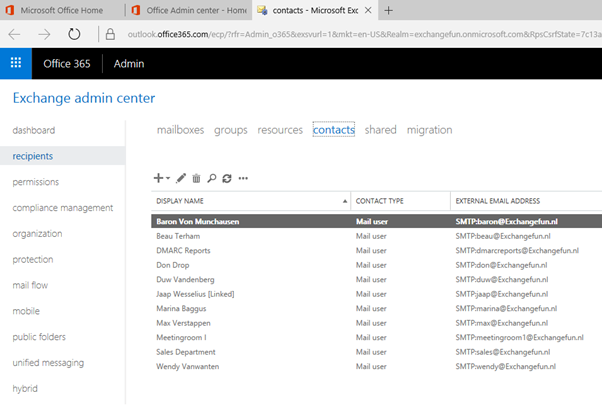 This makes sense, since the on-premises Mailboxes are represented as Mail-Enabled Users in Exchange Online. 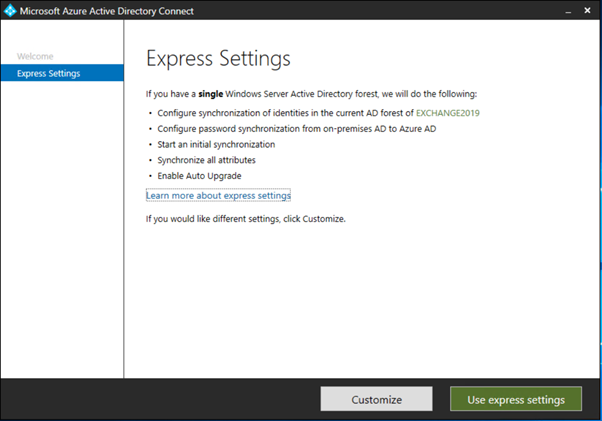 In this blogpost I’ve showed you how to implement Azure AD Connect in an existing Exchange Resource Forest model. 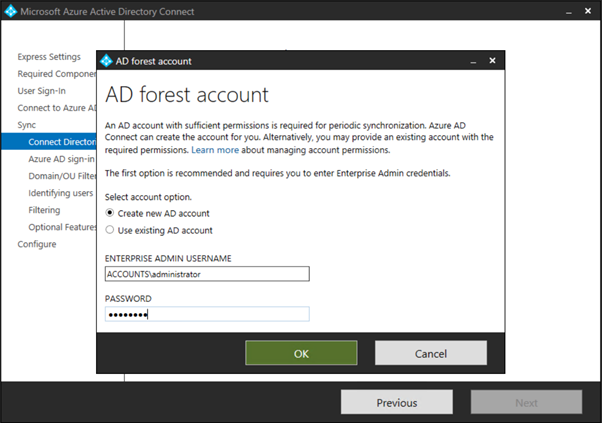 The Azure AD Connect server combines the user account from the Account Forest with the mailbox from the Resource Forest and synchronizes this to Azure Active Directory. 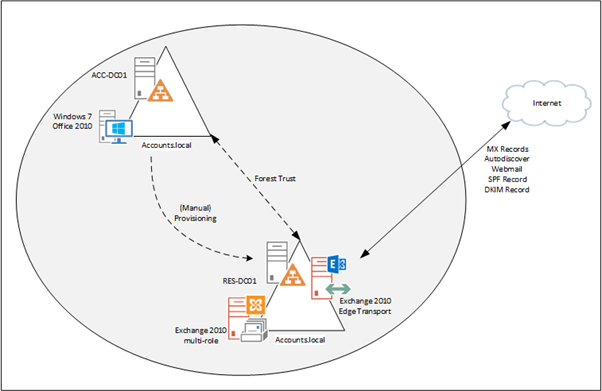 In my next blog I’ll create a hybrid environment based on the Exchange resource forest model.